Cattle grazing on Brachiaria grass at the ILRI campus in Nairobi, Kenya (photo credit: ILRI/Collins Mutai). 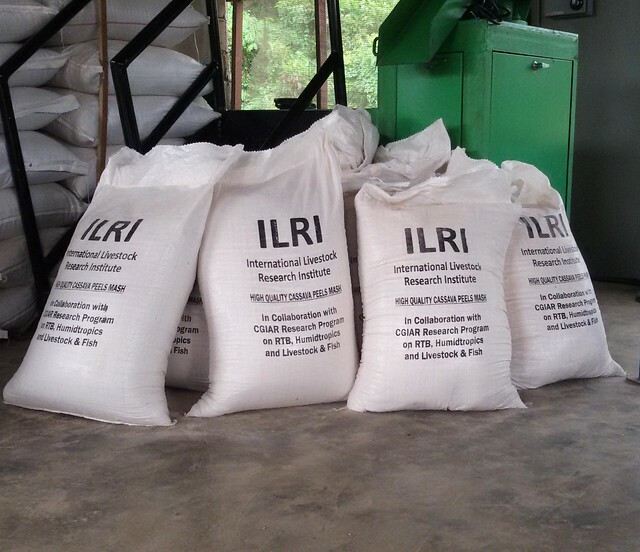 The following excerpts are taken from an opinion piece published by An Notenbaert, a former scientist with ILRI for 11 years who now serves as the tropical forages coordinator for Africa at the International Center for Tropical Agriculture (CIAT). ‘With the onset of the rains, livestock farmers around Kenya might breathe a sigh of relief. But they have come too late for the thousands of cattle that have already died, hit by the drought that led President Uhuru Kenyatta to declare a national disaster in February this year. . . .
Our research shows that new, high-quality, drought-tolerant forage grasses could boost milk production by up to 40 percent, generating millions of dollars in economic benefits for struggling East African dairy farmers. ‘Some of these new varieties of a grass called Brachiaria, are high-yielding, nutritious and, because they are easier for cows to digest, animals produce far less of the greenhouse gas methane per liter of milk produced. ‘These benefits make it the most extensively used tropical forage in the world, with seed production already commercialized in big cattle-producing countries like Brazil. Yet Brachiaria grass originates in Africa. . . . The conventional wisdom on the causes of widespread desertification is false. 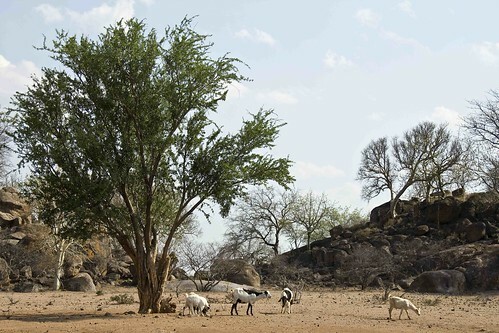 Goats graze drylands in the dry season in Zimbabwe (photo credit: ICRISAT/Swathi Sridharan). The picture of the Sahara as marching inexorably south year after year is incorrect and was, moreover, an illusion created not by livestock over-use but rather by a recent string of dry years. Indeed, decades of satellite data are now confirming that the southern edge of the Sahara periodically moves south and north in response to changes in rainfall rather than changes in livestock populations. It thus appears that the conventional wisdom on the causes of widespread desertification is false. Excerpts from Scoones’ excellent review, with its important messages, follows. ‘A great new book has just been published called The End of Desertification? Disputing Environmental Change in the Drylands . . . . It is edited by two people who know a thing or two about these issues—Roy Behnke and Mike Mortimore—and it has 20 top quality chapters from all over the world, documenting why the term desertification has passed its sell-by date, if it ever had one at all. It is an impressive and timely synthesis . . . . The myths of desertification have a long history. Ideas of desiccation and desert advance framed colonial science, informed by the narratives of the ‘dust bowl’ in the US. Yet whether from long-term environmental monitoring, areal and satellite photography, ecological modelling or local knowledge and field observation, the standard narratives have been found severely wanting. ‘Unfortunately this accumulated evidence has been ignored, and the narratives of desertification persist. . . .
‘In the 1970s, influenced by the new mathematics of complexity, ecologists such as Bob May argued that stability not an expected feature of ecosystems, even under deterministic conditions. In the context of African rangelands, Jim Ellis and team in Turkana—notably through the classic 1988 paper—contributed to an understanding of ecosystems not at equilibrium where density-independent factors (rainfall/drought/flood/snow) meant that animal populations were not at equilibrium, and different management regimes needed to apply. ‘Challenges to desertification myths, and simplistic equilibrium approaches to rangeland dynamics based on Clementsian succession ecology, have long been made. . . . A new paradigm for African rangeland management was born. . . .
Why is it that, even when scientific evidence is incontrovertible, then shifts in policy discourse and practice doesn’t happen? Rapid adaptations of sheep to plateau and desert environments. The same goes for livestock improvement, only, unlike the case for crop varieties, we have no similar genebanks storing the diversity of animals that would allow us to pull out of the freezer a whole goat or camel, say, the breed of which had disappeared from the world’s fields. Once gone, these animals are gone for good. That’s one of the reasons that livestock genetics is such an important area of study. The world is losing its diverse livestock breeds at a rapid clip (estimated by the Food and Agriculture Organization of the United Nations at an average loss of two breeds every week). If we want to understand the genetics underlying the ability of some animals to withstand great heat or cold, or to resist some diseases, or to thrive on scarce water or poor fodder, we need to be conducting those investigations today, while we still have a diversity of farm animals to investigate. And most of those diverse animals are being raised in developing countries. Among the scientists focusing on the developing world’s remaining rich farmyard diversity is Han Jianlin, who is based in Beijing. Jianlin is a livestock geneticist on joint appointment at the International Livestock Research Institute (ILRI) and the Chinese Academy of Agricultural Sciences (CAAS)-ILRI Joint Laboratory on Livestock and Forage Genetic Resources (JLLFGR), which is housed in CAAS’ Institute of Animal Science. Jianlin is one of 22 Chinese authors of a new paper published in the scientific journal Molecular Biology and Evolution (7 Jul 2016, advance access). destroying communities,” urged Monique Barbut, Executive Secretary of the UNCCD. (See PRESS RELEASE below). Willem Van Cotthem: We keep hoping that success stories and best practices will be applied at the global level. Priority should be given to methods and techniques providing daily fresh food to the hungry and malnourished. It cannot be denied that hunger and malnutrition are constantly undermining the performances of people. Application of existing success stories in local food production (kitchen gardens, school gardens, hospital gardens, …) would positively influence the efforts to combat desertification (limiting erosion, stimulating reforestation, etc.). We keep hoping. Reply: Willem Van Cotthem : Hello Friends at the UNCCD Secretariat: It will be my pleasure to select a series of success stories in the literature. However, I am convinced that the UNCCD secretariat has the necessary documentation to compile even a book on this subject (to the best of my knowledge the documents, e.g. presentations at COPs and meetings of CST and CRIC, have been there during my active period in the CST and in Bonn). Please consider a consultancy to achieve top class work that would serve all member countries, the CST and the CRIC. To be presented at the next World Day June 17th 2016. “Protect Earth. Restore Land. Engage People. This is the slogan for this year’s World Day to Combat Desertification to be held on 17 June. I am calling for solidarity from the international community with the people who are battling the ravages of drought and flood. Let us find long‐term solutions, not just quick fixes, to disasters that are destroying communities,” urged Monique Barbut, Executive Secretary of the UN Convention to Combat Desertification (UNCCD). The droughts and floods beating down on communities in many parts of the world are linked to the current El Niño, which is expected to affect up 60 million people by July. In some areas, including in North Eastern Brazil, Somali, Ethiopia, Kenya and Namibia, the El Niño effects are coming on the back of years of severe and recurrent droughts. It is impossible for households that rely on the land for food and farm labor to recover, especially when the land is degraded. What’s more, these conditions do not just devastate families and destabilize communities. When they are not attended to urgently, they can become a push factor for migration, and end with gross human rights abuses and long‐term security threats. “We have seen this before – in Darfur following four decades of droughts and desertification and, more recently, in Syria, following the long drought of 2007‐2010. It is tragic to see a society breaking down when we can reduce the vulnerability of communities through simple and affordable acts such as restoring the degraded lands they live on, and helping countries to set up better systems for drought early warning and to prepare for and manage drought and floods,” Barbut said. Ms Barbut made the remarks when announcing the plans for this year’s World Day to Combat Desertification, which will take place on 17 June. “I hope that World Day to Combat Desertification this year marks a turning point for every country. We need to show, through practical action and cooperation, how every country is tacking or supporting these challenges at the front‐end to preempt or minimize the potential impacts of the disasters, not just at the back‐end after the disasters happen,” she stated. The United Nations General Assembly designated 17 June as the observance Day to raise public awareness about international efforts to combat desertification and the effects of drought. Ms Barbut thanked the Government and People of China, for offering to host the global observance event, which will take place at the Great Hall of the People in Beijing. “China has vast experience in nursing degraded lands and man‐made deserts back to health. This knowledge can and should benefit initiatives such as Africa’s Great Green Wall, the re‐ greening in southern Africa and the 20 X 20 Initiative in Latin America. We can create a better, more equal and climate change‐resilient world,” she noted. “I also call on countries, the private sector, foundations and people of goodwill to support Africa when the countries meet later in the year to develop concrete plans and policies to pre‐ empt, monitor and manage droughts,” Ms Barbut stated. The 2016 World Day campaign is also advancing the Sustainable Development Goals adopted in September last year. The Goals include a target to achieve a land degradation‐neutral world by 2030. That is, a world where the land restored back to health equals to, or is more than, the amount degraded every year. With livestock production expected to more than double in the next 40 years, transforming cassava peels into high quality feed holds huge potential for African economies struggling to meet rapidly rising demand for animal-source products, according toresearch proposal recently published by three CGIAR centres. In times of severe drought her husband may have to take the cattle far away to look for pasture. A study that evaluate the changing nature of pastoralists’ institutional arrangements in response to socio-economic and ecological changes over a period of 10 years, and assessed how these changing arrangements are contributing to value of ecosystem services benefits, shows that co-management is now a significant feature of current institutional arrangements in northern Kenya. Three types of institutional arrangements including elders only, group ranch committees and community conservancy boards were reviewed. Results showed that management of the rangelands has changed over time and co-management is now positively influencing the economic benefits communities derive from these ecosystems and is enabling pastoralists to diversify their livelihoods as part of enhancing their resilience. The study was carried out in Isiolo, Laikipia and Samburu. A woman milks one of her goats in Ségou District, Mali (photo credit: ILRI/Valentin Bognan Koné). Livelihoods advisers and other interested development professionals can now benefit from a new learning resource on food safety in developing countries. It was written by Delia Grace, a veterinary epidemiologist and food safety expert at the International Livestock Research Institute (ILRI) and published by Evidence on Demand, an international development information hub supported by the UK Department for International Development (DFID). The learning resource, Food safety in developing countries: An overview, aims to provide ‘non-food safety experts’ with a good understanding of foodborne disease within the broader context of ‘development’ discussions. It assumes that readers already have a solid grasp of international development contexts, and current development discourse.